Scroll to see more Afromosia logs! 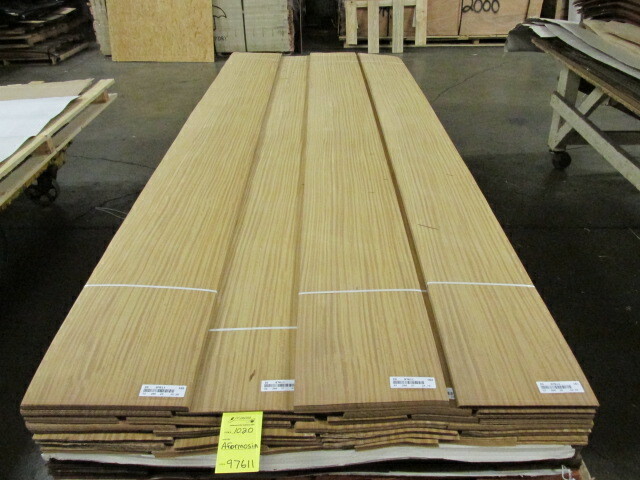 Afromosia Hardwood Veneer is a softwood, but has hardwood characteristics. This makes it a great choice for cabinetry and other options. In addition, it is used for boat interiors, because the wood repels water. In fact, some refer to Afromosia as African Teak. It grows in Africa’s dry forests. Furthermore, Afromosia is ideal for architects and designers who are in the marine industry. Get to work on creating furniture and paneling for your customers’ favorite yachts! Pattern: Grain straight to interlocked and some rope. Resembles Teak and is not oily. Characteristics: Heavy, dense, and durable. Uses: Flooring, furniture, exterior and interior uses, cabinetwork, and decorative veneer. The deep honey color and linear grain of the Afromosia will bring balance and warmth to your next project.